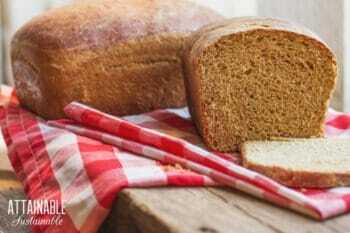 Homemade bread is one of the best places to start saving money and moving towards sustainability in your home kitchen. You eliminate those plastic bags, the gasoline necessary to get to the store, and any questionable ingredients in the loaf itself. This sandwich bread recipe will make your whole house smell delicious! While yeast breads can be intimidating, they can be fairly simple and straightforward once you get the right recipe under your belt. This sandwich bread is a great beginning point and is a foolproof recipe in many ways. For one, it uses instant yeast which doesn’t require the proofing phase that active dry yeast needs. So a simple mix of dry and then wet ingredients in a single bowl begins the process to make this loaf of bread. The other little trick I utilize, both for yeast and sourdough bread, is avoiding the intensive kneading period most commonly called for. Kneading is necessary for this loaf, but with a bench rest technique learned from the inimitable Peter Reinhart, far less flour is needed to keep the loaf from sticking. This results in a lighter loaf, even when upwards of 50% of the flour is whole grain. So yes. While this sandwich bread can be made with bread flour for a white loaf, you can adjust the ingredients to include whole wheat flour. Best of all, this homemade sandwich bread recipe slices up clean and thin for sandwiches or morning toast. Make sandwiches or serve it with homemade preserves and a fresh batch of cultured butter for breakfast. Homemade bread is one of the most satisfying recipes to tackle! 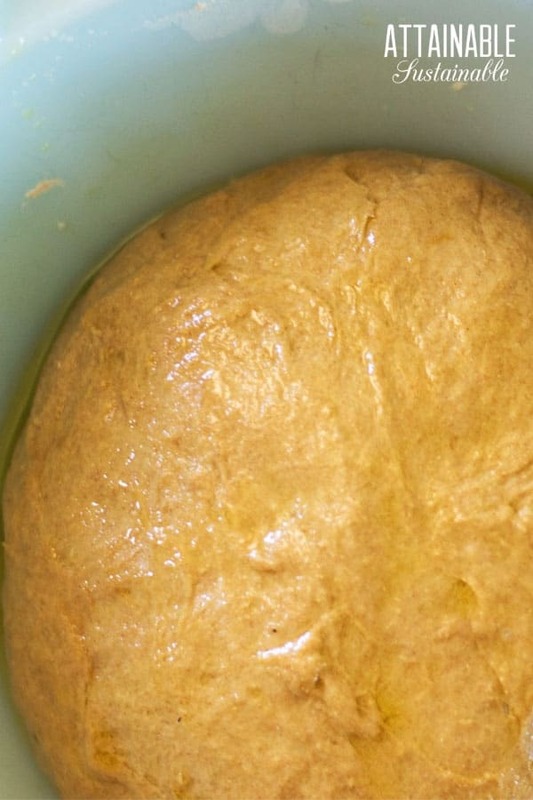 Yeast bread may seem intimidating at first, but this recipe will walk you through the basics. Combine 6 cups of the bread flour with the instant yeast and salt in a large mixing bowl. Once the dry ingredients are well combined, make a well in the middle of the flour. Pour in the water, oil, honey, and eggs. Beat together the liquid ingredients and then begin pulling the dry ingredients into the wet. Mix into a shaggy dough and then transfer to a floured work surface. Knead the dough five minutes, adding flour as needed to prevent sticking. Allow dough to rest on bench for five minutes, covered with a damp towel. Return to the dough and knead two minutes. Allow dough to rest two minutes. Knead dough one more minute, form into a smooth round ball, and then flip the smooth side of the dough over, placing it into a well-oiled bowl. Move the dough around to coat the top in oil and then turn it over. This prevents sticking. Cover with a damp towel and place in a warm spot to rise one to two hours, or until doubled in volume. Grease two 9x5" bread pans using either butter or coconut oil. Uncover the dough and cut into two equal pieces. Punch down the first dough ball and place on a clean work surface (the dough should be oily so no need to use flour). Press dough into a rectangle and roll into a loaf shape, pinching the seams shut. Transfer to bread pan and repeat with second loaf. Cover the bread pans loosely with a damp towel and allow to rise in a warm space for an additional 45-90 minutes or until dough is approximately 1/2" above the rim of the pan. Preheat the oven to 350 degrees. Once the oven is hot, transfer the loaves to the oven and bake 30-35 minutes or until golden brown. You can be sure it is baked through by removing the loaf from the pan and thumping the bottom. If it sounds hollow, it is done. Allow the fresh loaf of bread to cool for at least 30 minutes before slicing. 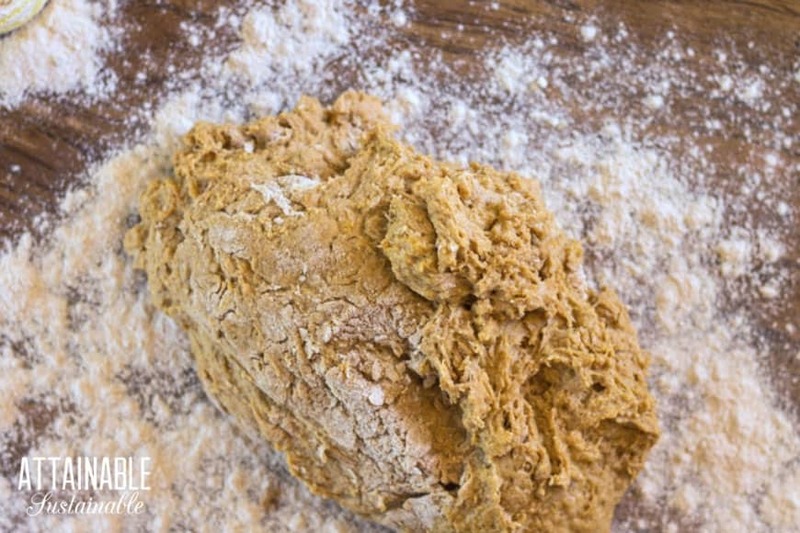 You can substitute up to 50% of the flour volume with whole wheat with little to no change in texture. I’m going to have to give this a try. My husband loves my homemade bread, but complains that it is too crummy for sandwiches. I’m curious, what do you keep your bread in? I usually reuse gallon ziplocks, but there must be a better option. Thanks! Great recipe. I’m definitely going to make this again!